Taipei, Taiwan—April 2, 2013—CyberLink Corp. (5203.TW) today launched PowerDVD 13, the latest version of the market-leading media player for Blu-ray, 3D & HD content. With shipments of more than 100 million players annually, PowerDVD is the world’s pre-eminent movie and media player. The world’s first and only cross-platform playback solution, PowerDVD 13 adds mobility to playback with support for leading tablets and smart phones. With improved TrueTheater enhancements, all content – even Blu-ray movies – can be enjoyed in a better-than original quality. New UltraViolet™ digital download support will provide cloud-based access to movies and TV shows in countries where the service becomes available. Offering unrivaled format support and instant startup, PowerDVD 13 meets all digital media’s user needs. Video Beyond HD - CyberLink’s unique TrueTheater HD delivers advanced edge, color and lighting enhancement technologies to take Blu-ray and HD digital movies well beyond their original quality. Consumers can now enjoy richer, sharper video, particularly on larger screens. Speed and Responsiveness with Industry-Leading Startup Times – A new architecture and application optimization delivers the fastest, most responsive PowerDVD ever. Blu-ray movies now start up to 58% faster with CyberLink’s innovative BD-Live bypass option. Photo, video and music playback start instantly, eliminating the need for any other media player. Universal player – PowerDVD supports all popular video, audio, photo and music formats from discs or files, including new AVCHD 2.0, lossless APE audio, 4K and MKV, and comes with a new mini player mode for music. 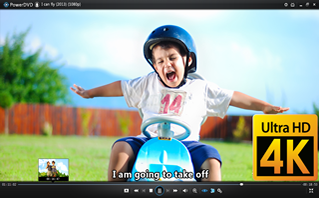 Across Devices - In addition to Apple and, Android smartphones and tablets, PowerDVD Mobile is now available for Windows 8 tablets – the only multimedia software to support MKV and DTS playback under Windows 8. 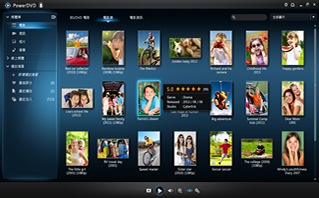 PowerDVD 13 users can stream and copy content seamlessly across connected devices on home networks. All New Movie Library - The new dedicated Movie Library enriches users’ movie collections with key information such as cover art, plot synopses and reviews curated from leading entertainment websites as well as CyberLink’s popular online community, MoovieLive.com. Additional enhancements - PowerDVD 13 comes with a wide range of new and improved technologies – all designed to enhance the playback experience including: High DPI mode; auto TV’s refresh rate for DVDs; enhanced DLNA compatibility; a new subtitle rendering engine; folder drag-and drop support for starting playback; new playback controls and much more. PowerDVD Mobile and PowerDVD Remote can be found on the Apple Store and Google Play Store. 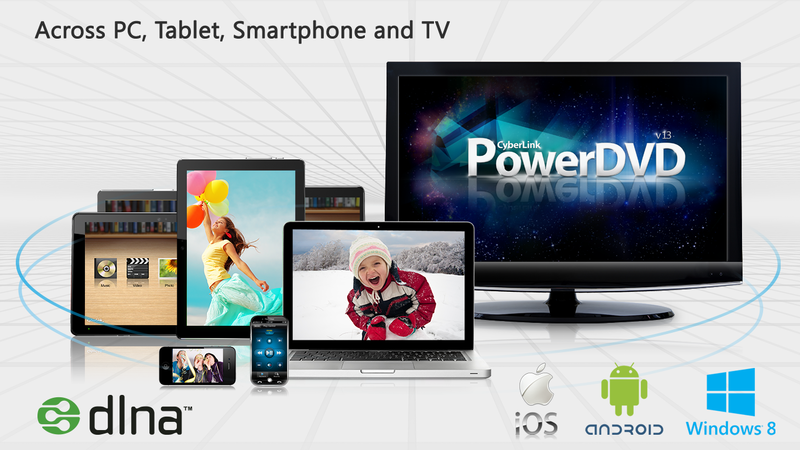 PowerDVD Mobile for Windows 8 is available from the Windows Store. For more information, please visit www.cyberlink.com. Founded in 1996, CyberLink Corp. is the world’s leading multimedia software company. With over 100 patented technologies that provide a solid foundation on which to continuously revolutionize the way multimedia is experienced, CyberLink’s visionary outlook has allowed the company to grow rapidly. This ultimately led to a record-breaking IPO on the Taiwan Over-the-Counter Exchange (OTC: 5203) in 2000. CyberLink is currently listed on the Taiwan Stock Exchange (ticker symbol: 5203.TW). CyberLink’s broad portfolio of multimedia applications can be categorized into two main areas: Media Entertainment – PowerDVD being the flagship product in this category, provides the latest in media playback on PCs, across devices in the home network, and on-the-go with portable smart devices; and Media Creation – offers a series of software to create enticing videos & photos, author Blu-ray & DVD discs and more. CyberLink has built strategic partnerships with leading CPU and GPU providers and a solid reputation for delivering high-quality, interoperable, and fast time-to-market solutions that keep our OEM partners from top PC brands on the leading edge. CyberLink's worldwide headquarters are located in Taipei, Taiwan, with regional operations offices in North America, Japan, Europe and Asia-Pacific. The company has 700 employees worldwide, with more than 500 engineers in product design and development. CyberLink USA: Amy Peterson at cyberlink@famapr.com or by phone at 617-986-5026. All companies and product names mentioned herein are for identification purposes only and are the sole property of their respective owners. Copyright © 2012 CyberLink Corp. All rights reserved.